Location: Blaney, County Fermanagh, Northern Ireland. Notes: Tully Castle is a castle situated in County Fermanagh, Northern Ireland, near the village of Blaney, on Blaney Bay on the southern shore of Lower Lough Erne. The Blaney area takes its name from Sir Edward Blaney, who was among the English advance party sent to Fermanagh to organise the Plantation. 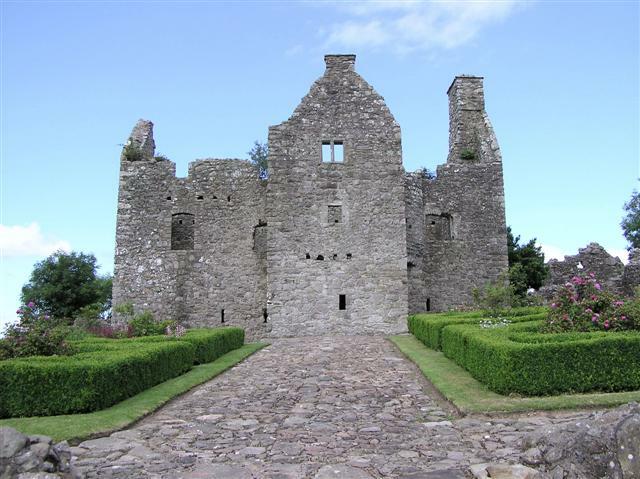 Tully Castle is a fortified house with a rectangular bawn and was built for Sir John Hume, a Scottish planter, in 1619. The bawn had four rectangular corner towers. During the Irish Rebellion of 1641, Rory Maguire set out to recapture his family's lands. He arrived at Tully Castle with a large following on Christmas Eve, and found the castle full of women and children. Most of the men were away. Lady Mary Hume surrendered the Castle, believing that she had assured a safe conduct for all in her care, but on Christmas Day the Maguires killed 60 women and children and 15 men, sparing only the Humes. The castle was burnt and the Humes never went back. Thereafter, the Hume family seat was replaced nearby with Castle Hume Hall designed by Richard Cassels. Tully Castle and village site are State Care Historic Monuments sited in the townland of Tully, in Fermanagh District Council area, at grid ref: H1267 5664.